Indian High Commissioner Ajay Bisaria on Friday called on Pakistan’s prime minister-in-waiting Imran Khan and discussed bilateral relations even as he voiced the Indian leadership’s concerns over terrorism and cross-border infiltration. Bisaria also felicitated the Pakistan Tehreek-e-Insaf chief on his success in the election. “The Indian High Commissioner briefed the PTI leadership on India’s concerns about terrorism and cross-border infiltration,” the Indian High Commission here said in a tweet. Khan’s PTI emerged as the single largest party in the July 25 general election and it nominated him as prime minister. He will take oath as prime minister on August 18. The Indian envoy met cricketer-turned-politician Khan at his Banigala residence in the suburbs of the capital. 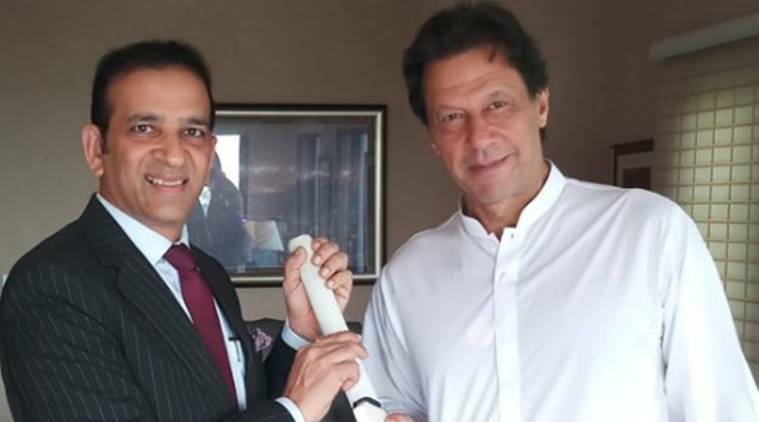 He discussed various issues with Khan including the bilateral relationship and also presented him a cricket bat signed by the Indian cricket team. “Indian HC Ajay Bisaria called on Mr Imran Khan, Chairperson & senior leadership of PTI. HC congratulated @ImranKhanPTI on his electoral success, discussed range of issues, prospects of India-Pak relationship. HC gifted a cricket bat autographed by the entire Indian cricket team,” the mission said in another tweet. Bisaria also felicitated Khan on behalf of Prime Minister Narendra Modi and discussed matters of mutual interest. Khan stressed the need to restart the dialogue between the two countries on all outstanding issues, including Kashmir. He also expressed concern over alleged human rights violations in the Valley, Pakistani media reported. Khan also hoped for India’s participation in the SAARC summit, scheduled to be held in Islamabad. The SAARC summit was to be held in Islamabad in November, 2016 but after a major terror attack on an Indian Army camp in Uri in Jammu and Kashmir on September 18 that year, India expressed its inability to participate in the summit due to “prevailing circumstances” and stepped up diplomatic pressure on Pakistan. The summit was called off after Bangladesh, Bhutan and Afghanistan also declined to participate. The meeting between Khan and the Indian envoy came after Prime Minister Narendra Modi on July 30 called and congratulated the PTI chief on his electoral success. The Indian envoy said that after Modi’s telephone call to Khan, there was a new optimism in India that relations would move forward in the right direction, the Express Tribune reported. “India is confident that relations with Pakistan will take a turn for the positive,” the Dawn quoted Bisaria as saying. Earlier, in his victory speech, Khan had also offered to build good ties with India. Meanwhile, PTI leader Faisal Javed Khan announced on Twitter about three former Indian cricketers being invited for the oath-taking ceremony. “Cricket legends from India and Kaptaan’s (Khan) old friends Kapil Dev, (Navjot) Sidhu and Sunil Gavaskar have been invited to attend Oath Taking Ceremony of Pakistan’s PM Imran Khan,” he said. Indo-Pak ties had been strained after the terror attacks by Pakistan-based groups in 2016 and India’s surgical strikes inside Pakistan-occupied Kashmir. The sentencing of alleged Indian spy Kulbhushan Jadhav to death by a Pakistani military court in April last year further hurt bilateral relations.